Having a clean home can reduce the spread of disease (especially if you have young children), as well as make the living environment more pleasant for your family and your guests, but using harsh chemicals cane be just as dangerous as not cleaning the dirt and germs that find their way into your house. Therefore, a balance must be reached between having a clean house and also reducing the presence of harmful toxins in your home. One way to figure out whether or not your home cleanliness is balanced is to check for odors. Foul odors are traditionally associated with a dirty space in your home, but can also result when household cleaners that are high in chemicals are overused. To properly eliminate odors without chemicals, dirty or soiled areas should be properly cleaned with natural products to avoid merely covering one odor with another, more toxic, odor. Many people just assume that the cleaners that they have in their houses are safe for use around pets and children, particularly if the cleaners are manufactured by well-known brands. However, studies from the Florida Department of Environmental Protection have shown that the average American home contains 63 individual synthetic chemical products, which equals about 10 gallons of harmful chemicals. Fortunately, with the right green cleaning products it is simple to avoid these harsh chemicals while still enjoying a clean environment. Green cleaning refers to a method of cleaning that uses environmentally friendly ingredients to maintain human health and environmental quality by forgoing strong toxic chemicals in favor of safer natural ingredients. 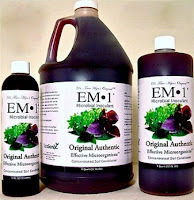 One popular green cleaning product is Dr. Higa’s Activated EM•1®. If you have pets you know how strong pet odors can be on carpets and furniture where pets have urinated. EM•1® can eliminate even the strongest pet odors. Green cleaning is clearly safer for your family, but it has also been proven to have a positive environmental impact as well. Green cleaning releases fewer toxins; so, over a large scale, green cleaning can improve air quality and avoid damage to the earth’s atmosphere. Therefore, when you use green products, you can be confident that you’re not jeopardizing the quality of life for future generations. Additionally, most green cleaning products perform as well as, if not better than, traditional cleaning products so you won’t have to sacrifice effectiveness for safety. When you decide to switch to green cleaning, be sure to dispose of your old cleaning products properly. It is not safe to pour these toxic cleaning products down the drain or dispose of them in a landfill. Instead, go online and look for safe places around your city or town to dispose of these toxins. These places sometimes include drop off centers in health food stores, supermarkets, or government buildings. This ensures the toxins will not make their way into your community’s ground water. If you make your own a green cleaners for the home feel free to share additional recipes below! Surely teatree oil has desinfectant properties? Wouldn't that defeat the purpose? Anyway: I got rid of all chemical cleaning stuff years ago, and I keep my house clean and smelling sweet with just EM-A and microfibre cloth. If something is especially greasy, I use a bit of natural hand soap. I wish I could have my house tested for "germs", so I could prove that it's really clean... Because I'm quite sure that I have a very clean and healthy home-environment :).